The Ariane 5 for January 27’s mission with Intelsat 29e takes shape, beginning with the positioning of its cryogenic core stage over the launch table in the Spaceport’s Launcher Integration Building (photo at left). One of the two solid propellant boosters is transferred to the Launcher Integration Building (center photo), and Ariane 5 is initially “topped off” with its upper stage and vehicle equipment bay (photo at right). Build-up of the initial Ariane 5 to be launched in 2016 has begun at the Spaceport in French Guiana, continuing Arianespace’s sustained mission pace and readying an unusual single-payload flight for the heavy-lift workhorse. 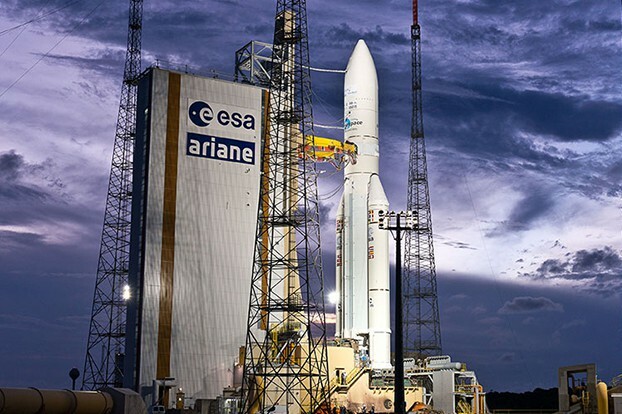 With liftoff scheduled on January 27, the Ariane 5 is to loft Intelsat 29e – the first of the Intelsat EpicNG high throughput satellites. This relay platform will have one of the most advanced digital payloads commercially available, delivering enterprise-grade, broadband services to fixed and mobile network operators, aero and maritime mobility service providers, and government customers operating throughout the Americas. As the 56th Intelsat spacecraft to be orbited by Arianespace, Intelsat 29e has the distinction of being a solo telecommunications satellite on a dedicated Ariane 5 flight – instead of the typical two-passenger configuration for the launcher on missions to geostationary transfer orbit. Intelsat expects to launch its second Intelsat EpicNG satellite, Intelsat 33e, in the third quarter of 2016, also using Arianespace launch services. Intelsat 33e will serve Europe, Africa, the Middle East, and Asia. The January 27 mission with Ariane 5 and Intelsat 29e is designated Flight VA228 in Arianespace’s numbering system, notating the 228th launch of an Ariane since this series of European vehicles entered service in 1979. Flight VA228’s Ariane 5 is taking shape inside the Spaceport’s Launcher Integration Building where the activity began with the cryogenic core stage’s positioning over one of two launch tables for the heavy-lift vehicle. The side-mounted solid propellant boosters were then integrated, followed by installation of the combined upper stage and vehicle equipment bay atop the core stage. Once the basic build-up is complete, Ariane 5 will be ready for transfer to the Spaceport’s Final Assembly Building – where launcher prime contractor Airbus Defence and Space hands over responsibility to Arianespace for Intelsat 29e’s integration, final checkout and rollout to the launch pad for liftoff.